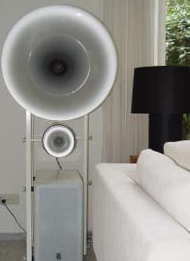 Beschrijving High efficiency horn > 104 dB Active subwoofer 250 Watt RMS,2x 10 inch driver Min. recommended amplifier power> 10 Watt RMS Dim. (hxwxd):155x67x68 cm.